Not bad, right? For a temporary solution, I'm very happy with how it turned out. Plus I learned what to do (and what not to do) when installing a fake backsplash, so you don't have to! First I began by measuring the space I needed to cover with the removable wallpaper. While it was tempting to just start unrolling and sticking the paper to the wall, I quickly realized that if I wanted the fake backsplash to look any bit realistic, I needed to be calculated in my actions. I used my measuring tape to determine how much and how many pieces I needed. Then I cut out the pieces, and temporarily taped them up to verify I did my measurements correctly. When taking the panels off the wall, I numbered them on the back to avoid later confusion! Make note: some temporary wallpapers do have a top and a bottom. 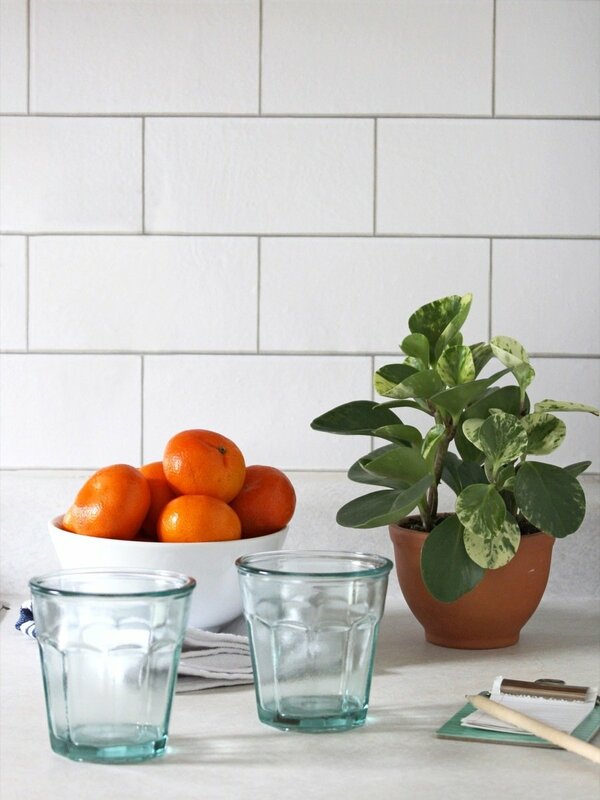 For example, this subway tile print had a white highlight where the top of each tile was supposed to be. Draw arrows on the back of your panels if you're having trouble remembering which side is up. 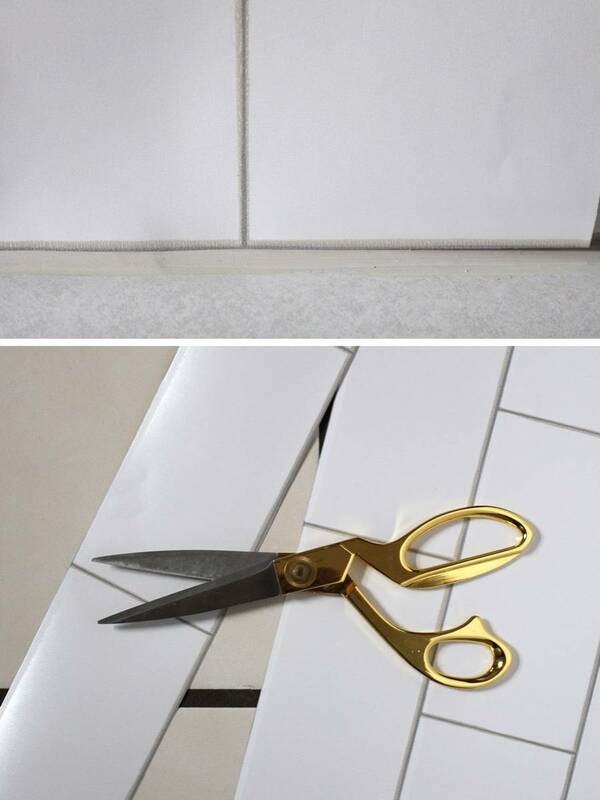 Cutting straight lines with this subway tile pattern was super simple. It was just a matter of following the lines on the print! If you're looking for exact cuts, cut with a craft knife and use a ruler as a straight edge. Here's the reason I had to take it slow and plan everything out: grout lines. Generally when you're applying vinyl wallpaper, you start from the top and trim off any excess on the bottom with a craft knife once it's all stuck in place. Since my print featured tile, and real-life tile doesn't just stop without showing a grout line, I needed to cut my pieces with exact precision if I wanted to pull this illusion off. That meant making sure the "grout line" started at the caulk line joining the counter to the wall. I measured the space, cut my pieces, then taped them to the wall and cut off excess at the top rather than the bottom (using a craft knife). Moment of truth. I began with a panel in the middle. Here's why: I figured at some point my alignment might get skewed, and rather than having to align to that error across the entire wall, I thought it'd be better if it only had to carry it in one direction. Fortunately the peel 'n stick paper I used can be repositioned easily, which I did end up having to do a few times. At the top of the panel, I peeled the backing off a few inches, then lined up the top of the paper with the bottom of the cabinets. I then slowly smoothed the paper to the wall, working from the middle outward. After the first piece went down, each sequential piece was aligned to the first, following the subway tile pattern. I left a little bit of overlap between each piece which allowed for a margin of error, but the overlap is also visible in the final product. You win some, you lose some. After putting down each panel, I smoothed out any bubbles with a squeegee, starting from the middle and working my way towards the edges. If you're dealing with a particularly stubborn bubble in the middle of your removable wallpaper, you can prick it with a pin and let the air escape that way. There is one (yes, ONE) outlet in my kitchen that I needed to take into account as I covered the walls. Before I started, I removed its faceplate with a screwdriver. Next, I taped up the panel that would be overlapping wit the outlet and traced the outline of the plugs. After removing the panel from the wall, I cut out the outlined area, then proceeded with sticking the panel to the wall. After the vinyl was up and air bubbles removed, I put the faceplate back on. Note: Don't try and cut out the outline of the electrical outlet while the removable wallpaper is on the wall. In the same way you don't want to put a fork in an outlet, you definitely don't want the blade of your craft knife slipping either. Shocking! Okay, this part is a little obsessive, but I was going for major illusion-town with my fake backsplash. Tile can't bend corners, right? If this were real tile, I would have had to cut smaller tiles and run a grout line up the corner. To fake this look, I took some of my scraps of vinyl wallpaper and cut the "grout" off, then carefully positioned them in the corner of the wall. Crazy, I know - but it's the devil that's in the details, right? The entire process took a few hours, but the more I did it, the easier it got. I think the important thing to remember when installing temporary wallpaper (for a perfectionist like myself, anyway) is it's name: temporary. It might not turn out perfect, but if you hate it you can always take it down! I don't hate it, though. I think this fake backsplash definitely bumps up the "quaint factor" in my rental kitchen. 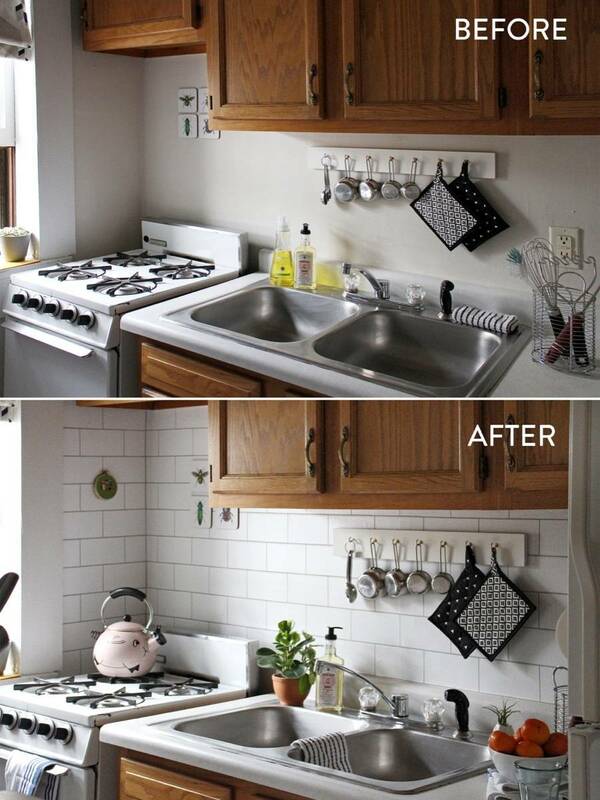 Pin this renter's solution on Pinterest! Hey renters: looking for even more temporary wallpaper solutions? We've rounded up a whole list of them for you! Great suggestion, they all look fantastic! @Adrianne That's a great question! I haven't removed it yet, and probably won't for another year or so. However, I've done contact paper treatments in past rental homes, and haven't had any issue ruining the wall. If you're nervous about it, you could always to a small test patch! This is beautiful! I noticed its been about a year now, I’m wondering if you’ve had to remove it yet? I’m very nervous about it damaging my apartment wall! @Judith Nigh - Thank you, it's an improvement! Really good job. Neat, clean and attractive. @Jari Becker - Right? Every time I walk into my kitchen now I have a "Woah!" reaction.